Decreased sensation in the 4th and 5th fingers plus weakness in the hand occur due to compression of the ulnar nerve in the cubital tunnel at the elbow. Mechanical compression and lack of blood supply to the nerve may be caused by arthritis, swelling, abnormal muscles around the elbow, traumatic injuries with secondary scarring and repeated elbow flexion. Diagnosis is made on the basis of clinical examination, history, and electromyographic (EMG) nerve studies which may show slowing of the ulnar nerve across the elbow. Treatment of ulnar nerve neuropathy depends on the severity of the condition. This may include medication, exercises, splints, and sometimes surgery. The surgery is to decompress the cubital tunnel or sometimes to move the nerve from behind the elbow to in front of the elbow to reduce the stretching and stress on the nerve. Non-surgical therapies may involve splinting, oral medications, steroids, and treatment of underlying medical problems. Light activities may be resumed within one week. Heavy construction jobs may require 6 weeks off work. Sutures are removed two weeks after surgery with activity levels increasing thereafter. 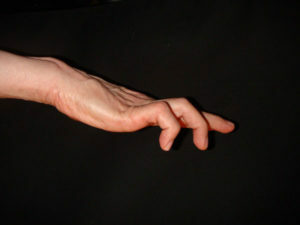 For more information on Cubital Tunnel Syndrome CLICK HERE.